For more than 25 years, Delta Controls has offered dependable and user-friendly building control solutions to commercial, government and retail buildings, as well as schools, universities, hospitals, airports and more. Delta Controls delivered the world’s first fully integrated native BACnet building solution encompassing HVAC, Lighting and Access products. Frost & Sullivan is a research and consulting firm that covers 10 industries and 31 markets, and maintains 31 offices with more than 1,700 industry consultants, market research analysts, technology analysts, and economists globally. This industry accolade is unique in that it is awarded by a company dedicated to the analysis and forecasting of high-tech markets since its inception in 1961. 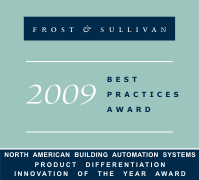 Frost & Sullivan analysts conduct a rigorous selection methodology unmatched by any other firm. Delta Controls will be accepting this award at the Frost & Sullivan Best Practices 2009 Excellence in Industrial Technologies Awards Banquet scheduled for Wednesday, April 8, 2009, at The Westin La Cantera Resort in San Antonio Texas. For more information about Delta Controls, visit www.deltacontrols.com.